A new version of the peer-to-peer sharing application Tribler has created a buzz online following claims by the software’s lead developer that the app is impervious to attack. In a recent interview with TorrentFreak, Dr Johan Pouwelse from the Delft University of Technology, said “the only way to take [Tribler] down is to take the internet down”. Tribler has been in development for five years and, as with many other file-sharing applications, is based on the BitTorrent protocol. 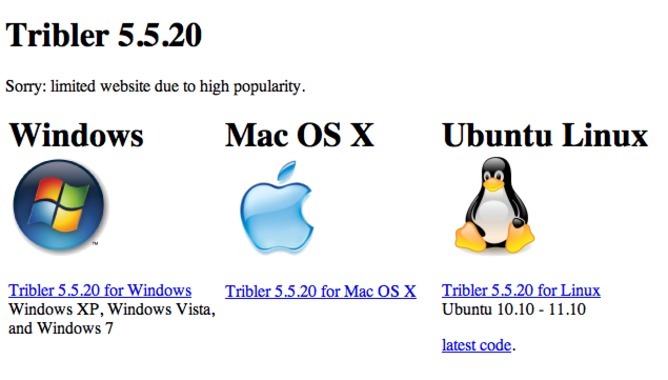 But unlike other BitTorrent platforms, Tribler is a decentralised system that works without the need for torrent sites – lists of links to files available for download through the BitTorrent protocol – and trackers. Instead, Tribler has been designed to search the internet for hosts that contain the desired files. Dr Pouwelse’s claims of Tribler’s invincibility are simply amazing. If he is to be believed, peer-to-peer file-sharers finally have a tool that can’t be turned off nor attacked by government and the music and movie industry. Sadly, these are difficult claims to take seriously. In the 1980s and 90s, music and movie companies flooded the internet with hosts containing music and movies that had been altered from their original form. The aim was to trick users into wasting time and bandwidth downloading a file that wasn’t the file they were looking for. One way files could be modified was with the addition of a cuckoo egg (as we all know, the cuckoo lays its eggs in another bird’s nest to trick the victim bird into tending the cuckoo egg). A cuckoo egg is a file that looks the same as the file a user is searching for – in filename and filesize – but is actually a totally different file. Watermarks can also be added to music and movies, allowing the files to be tracked across the network. This allows organisations such as PeerMedia Technologies – who provide this service to the music and movie industries – to identify people who have breached copyright. As countries move towards implementing traffic filters and systems to prevent cyberattack, it has become easier to identify and then disrupt, stop or distort Tribler traffic streams. The process of distorting, altering or substituting a different stream is not complex and in some ways may occur much as a “man-in-the-middle attack” is used to penetrate secure systems. (In such an attack, a third party intercepts traffic between two users, creating a fake stream of data, while making one – or both – users believe they are communicating with the other). Late last year a group of Australian ISPs – including Telstra and Optus – proposed a copyright infringement policy that would allow ISPs to send users a warning after five illegal downloads. The policy lists a range of consequences for customers that fail to comply with the warning notice, such as providing the copyright holder with access to the customer’s details upon request. Over time, we’re likely to see music, movie and media companies developing closer links with network carriers and ISPs because the internet is becoming the medium of choice for distributing this content. For carriers and ISPs, revenue from access systems is decreasing due to competition, leading to a decrease in the number of ISPs. At the same time, we’re seeing an increase in revenue from bundled products including music, movie and media distribution. Carriers and ISPs will increasingly want to reduce the amount of pirated content on their networks as copyright infringement reduces income from customers subscribing to IPTV – television delivered over the internet – video on-demand and music-streaming services. This symbiotic relationship between ISPs and media companies should be a cause for concern for peer-to-peer file-sharers. We shouldn’t be surprised if we even see music and movie companies buying ISPs in the near future. Regardless, claims about Tribler’s invincibility are almost certainly overblown, and it’s clear the battle between file-sharers and copyright holders is far from over. Mark A Gregory does not work for, consult to, own shares in or receive funding from any company or organisation that would benefit from this article, and has no relevant affiliations.